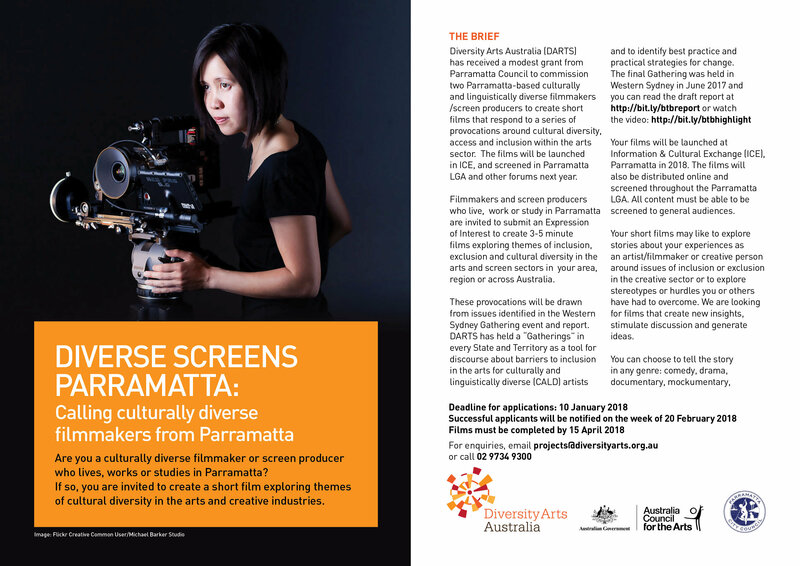 DARTS is looking for culturally and linguistically diverse filmmakers based in Parramatta to take on themes of diversity, access and inclusion in the arts in a short film. The films can be in any genre – comedy, drama, documentary or mockumentary and we are looking for films that create new insights, stimulate discussion and generate ideas. With the generous support of Parramatta Council, DARTS will commission two filmmakers to create 3-5 minute films. The films will be launched in ICE, and screened in Parramatta LGA and other forums next year. Filmmakers and screen producers who live, work or study in Parramatta are invited to submit an Expression of Interest by 10 January 2017. For more information, click here.